A Kasetsart University student has been named the public-relations ambassador for the Air Sea Land Games which run throughout this month in Pattaya and Sriracha. Supaporn Netwong, 20, won the April 23 final round of the beauty pageant over 12 other competitors at Central Festival Pattaya Beach. 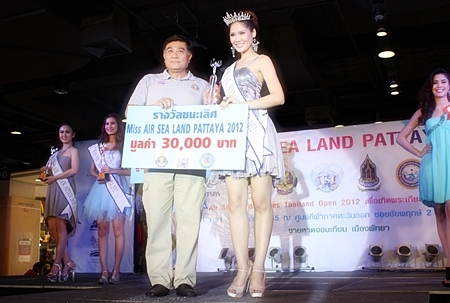 She took home a trophy, tiara and 30,000 baht cash. (L to R) Aphiya Ladkrathum, third runner up; Chanokanan Tochuwong, second- runner up; Supaporn Netwong, Miss Air Sea Land Pattaya 2012; Pimchanok Jitchu, first-runner up; and Thanyachanok Phetraiyuthpan, fourth runner up. A judges panel made up of city council and Education Office officials and Miss Teen Southeast Asia 2012 Chunita Wongwiboonrath chose Supaporn, sponsored by the Pattaya Club, from the 13 contestants to promote the May 1-31 games. Sponsored by the Royal Aeronautic Sports Association of Thailand, the games this year will expand to the National Indoor Sports Arena in Jomtien Beach as well as the usual venue at the Nongkor Reservoir stadium in Sriracha. The games are intended to give eastern residents a healthy diversion and prepare athletes for the upcoming National Sports Games. Among the events are skydiving from 6,000 feet by Royal Thai Navy paratroopers and aircraft enthusiasts, a miniature airplane demonstration, jet ski races, motocross competitions and other air sports. Among the 20 land-based sports offered will be off-road racing, motocross, horseback riding, polo, and beach football. On the sea, windsurfing and sailing will be featured.